Ek Aorat par kai sari responsibilities hoti hai ghar or bahar dono ki, un jimmadariyo key sath sath apni twacha ka khayal ralhna bhi ek bohot badi jimmadri hoti hai. aj ke is badaltey hue treaned may women bhi apni sondariya key liye jagruk ho rahi hai. 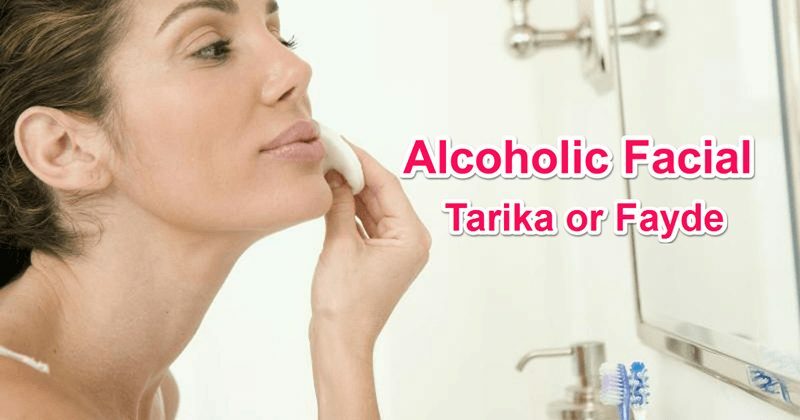 Apney face key glow ko banae rakhen key liye ap facial to karti hi hogi cahey wo ghar par ho ya parlour may, par kya apko pata hai abhi aloholic facial treand may hai or popular bhi wahi rehta hai jo treand key sath chalta hai, to chaliye ap bhi is alcoholic facial key barey may janeiye or treand may bani rahey apke glowing face key sath. Viskey ek anticeptic product, viskey facial se pimples or blackheads ki problem khatam ho jati hai. Viskey facial sabse jyada faiydeymannd unkey liye jinkey face key pores badey hotey hai, viski skin pores ko bannd karne may madad karti hai. Shampian facial, may grapes ka juice added hota hai, or jesa ki ham sab jantey hai ki grapes may antioxidants hotey hai jo ki skin aging ki prakriya ko slow kartey hai. Shampian facial se skin ko harm karne waley bactira se bhi shutkara milta hai. Shampian facial karwane se pehley beautision ya apni skin specialist se consult jarur kar ley. Vine may baki alcohols key mukabley antioxidants jyada hotey hai isi liye ye twacha key liye jyada faiydeymannd hota hai kuki vine skin se toxics dur karta hai. Vine facial se dead skin remove hoti hai jiski wajha se new cells jaldi aatey hai or skin glowing rehti hai. Vine facial normaly oily skin key liye suggest kiya jata hai. Note: dry skin waley ye facial na karey . Jinko acne ki problem hai or jo pimples se parshan hai unkey liye vodka facial labhkari sabit hota hai. Vodka antibacterial hota hai jiski waja se skin ko pimples se chutkara milta hai. Vodka facial pimples ko sukha deyta hai jisey ki skin kafi saf najar ati hai. Vodka kiwajha se skin losse nhi hoti hai or ye teenage may kafi amous hai . Kisi bhi tarha ka facial karne se peheley apkey skin specialist se jarur consult kar ley. Step 1. Vine facial ko shru karne se pehley cleansing milk se face jarur clean kar ley, oats ka paste bana key usmey kuch drops red vine key mila kar scrub karey, (red vine ko directlry skin par use na karey), scrub karne key baad steam le kuch mito tak isey blackheads or dead skin nikal jati hai. Step 2. Chera achey se saf ho jne par aloevera gel se massage karna na bhooley, ap koi sib hi gel us ekar skateyn hai par aloe jel natural hoti hai to wo use karna jyada better rehta hai. Step 3. ab koi sa bhi face pack banae jo apki skin ko suit akrta hai jese ki neem face pack, saffron ya job hi apko acha lagey, iskey baad jab pack such aje to uskpar kuch drop red vine key cotton ball ki madad se apply karey. ab is pack ko wash karen key baad, egg white face par lagae isey skin tight hoti hai. Step 4. ab jab ye pack such jae to is face par halka pani spry karey or ek cotton ball may vine drops mila key us cotton ball ki madad se is pack ko remove karey. Step 5. Facial key purey procedure end hone key baad sunscreeam lagana na bhooley. Facial se skin healthey or glowing rehti hai, facial se muscles may blood circulation bhi theek tarha se hota hai. I hope apko meri ye post jo ki ek treanding topic key upar thi achi lagi hogi or ye apkey kam aaega, agar apkey koi sujhaw hai to comment jarur kare share karey agar apko info achi lagi. wonderful post, very informative. I ponder why the other specialists of this sector do not understand this. You should proceed your writing. I am confident, you’ve a huge readers’ base already! Great information, Thanks for sharing this..